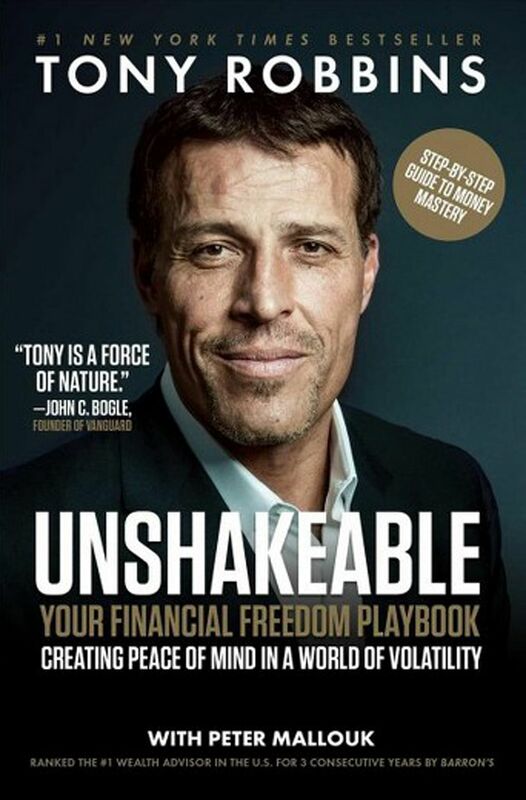 Unshakeable: Your Financial Freedom Playbook By Tony Robbins with Peter Mallouk. For more than 26 years, American life coach Anthony "Tony" Robbins has been walking around with a brain tumour. Robbins, 57, learnt he had it only at age 31, and has refused surgery or innovative drugs for his tumour lest these weaken him and stop him working his 50-hour weeks. He wrote this book to show everyone how to grow wealth slowly but surely and, more importantly, to feel emotionally fulfilled. Robbins was brought up by a drink-and drug-addled mother who brandished a knife at him and kicked him out of their home for good on Christmas Eve, 1977. He was then 17. He then worked as a repairman, janitor and aide to motivational speakers. By 24, he was a millionaire after finding his calling as a life coach. Today, he is worth almost US$1 billion (S$1.36 billion), has 31 companies, is considered one of the world's top 50 business thinkers and has coached former United States president Bill Clinton, TV icon Oprah Winfrey and tennis star Serena Williams. "You can be unshakeable," says Robbins, "but this is a gift that only you can give yourself." To avoid losing your hard-earned money, he adds, you must first know your way around investing, for which this book is a clear, comprehensive and grounded guide. 1. The human brain is designed to make you survive, not keep you happy, so it is always looking for problems. To counter that, catch any negative thought you have and redirect your mind towards that which energises you. As Robbins says, "What's wrong is always available... but so is what's right!" 2. It takes time to make money, so do not bail out of the stock market every time it nosedives. In fact, buy shares whenever the market is at its lowest point because those who do make the most money in the long term. After the global financial crisis in 2008 hit rock bottom on March 9, 2009, the S&P Index shot up by 69.5 per cent in the following six months. By 2016, the S&P Index had risen about 266 per cent since March 2009. 3. You will stay poor if you covet cash and spurn the stock market. In the long term, the difference between being a person who invests and one who stays on the sidelines can be at least US$30,000 (S$40,770). 4. If you will not pay US$200 for a US$2 snack, do not go near actively managed mutual funds as their excessive fees will drain you. Stick to index funds instead and cut your taxes because what matters is the net return on your investments, not how much you earn from them. 5. The best person to advise you on making the most of your money is one who can adapt to your changing circumstances over time, one who is experienced in managing people like you and one with whom you get on well. 6. As all markets are cyclical, your best insurance is to spread your money across industries, within sectors, across countries and across time spans. Real estate investment trusts (Reits), in particular, let you benefit whenever property prices soar while enjoying a healthy stream of current income.